In an effort to use some carrots before they spoiled and to get rid of all of the remaining ingredients from holiday baking (think calorie laden sweet stuff) I tinkered with muffin making yesterday afternoon and I think I found a winner. Although named carrot coconut muffins, I added currants and almonds too. 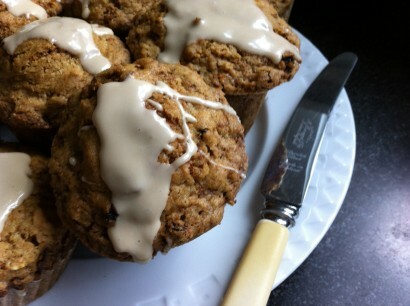 The result was akin to a morning glory muffin yet just a bit lighter in texture. Of course I had to top them off with a maple glaze- that too was to rid myself of confectionery sugar- a true weakness for me just knowing it is in the cupboard. 1. Preheat the oven to 350 degrees fahrenheit. Grease muffin tins. 3. Sift flour, cinnamon, baking soda and salt. 4. Add to the sugar/oil/egg mixture. 5. Mix the carrots, currants, coconut and almonds together. 6. Add to the mixture in the big bowl and mix. 7. Spoon the mixture into the muffin tins until they are nearly full. 8. Bake at 350 degrees fahrenheit for about 30 minutes. Check with a toothpick. If it comes out clean, remove from the oven. 9. Remove from pan and cool on a wire rack. 10. Glaze with icing if desired.